The idea is that Kaspar will be a “mediator” for human contact. The scientists believe that humans are the best models for human social behaviour, but their social behaviour is very subtle, elaborate and widely unpredictable. 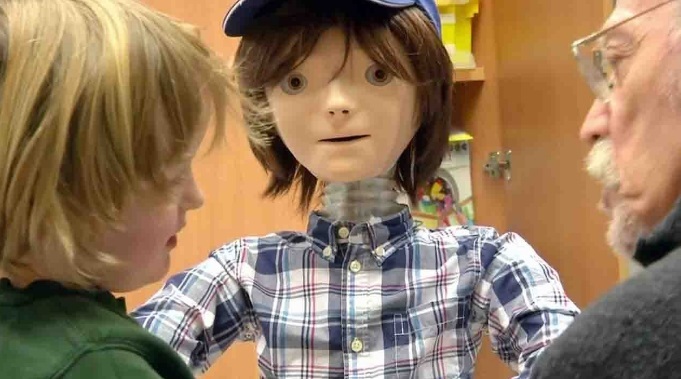 “Many children with autism are however interested in playing with mechanical toys or computers.” The robot’s eyes and mouth behave like a human’s and Kaspar has eyelids that blink. The head turns from side to side, nods and can tilt. Kaspar also responds to stimuli and can seem to be surprised at a sudden movement or gesture. These responses and movements can help some children to develop social skills.